In what usually is a rather uneventful month for news, December proved us all wrong in 2016. A number of newsworthy activities related to the content marketing industry appeared on the radar this month, and I believe they could work as a crystal ball for content marketers as we move into 2017. As Robert Rose and I covered in a recent This Old Marketing podcast, CNN bought the social media app Beme owned by YouTube celebrity Casey Neistat who amassed 6 million followers through his video blog. CNN is shutting down the app and asking Casey and his team to start a new media platform. Basically, CNN is looking to target a new audience, one that it believes Neistat holds the keys to. Instead of organically growing a platform or finding a leader within its ranks, CNN just went out and purchased Neistat and his team for $25 million. Takeaway: Influencer marketing was hot in 2016. Look for influencer marketing to shift a bit from partnering with content creators and distributors to flat-out purchasing them. Earlier this month, Kellogg’s pulled its advertising from Breitbart.com, which has been in the news a lot since President-elect Donald Trump named Steve Bannon, Breitbart’s former chairman, as a top adviser. Breitbart, which Bannon proclaimed is the “platform for the alt-right,” has a very particular point of view, and one that Kellogg’s doesn’t agree with. Hence, the removal of Kellogg’s advertising from Breitbart’s site. 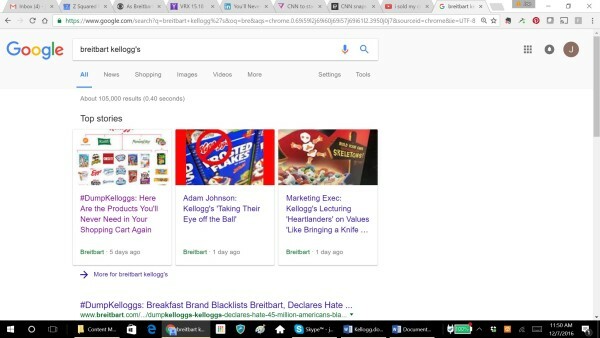 To combat this, Breitbart aggressively came after Kellogg’s with a #DumpKelloggs campaign, where Alexander Marlow, Breitbart News editor-in-chief stated, “Boycotting Breitbart News for presenting mainstream American ideas is an act of discrimination and intense prejudice.” The campaign trended on Twitter and was picked up by all the major news outlets. According to FiveThirtyEight, Breitbart.com’s traffic increased at a faster rate than almost every other media site during the election process. Whether you agree with its site or not, there is power in its audience and growth. Kellogg’s simply has no power to combat this. Sure, it can send out a news release and talk with the press. It can do an ad in The Wall Street Journal or some other outlet, but Breitbart has a huge audience of followers and can basically attack anyone it wants without repercussion. In the future, how does Kellogg’s combat this? How does any company combat a situation when an organization with a large audience comes after them? Takeaway: This type of action from Breitbart and other media companies against brands will only multiply in 2017. The only way for companies to battle this is to create their own large, loyal audiences. Look for a content marketing/PR business case to be front-and-center in any large enterprise out there for 2017. As of this writing, YouTube megastar PewDiePie (aka Felix Kjellberg) has been extremely critical of YouTube over the past few months. Specifically, PewDiePie believes that YouTube’s algorithm changes are costing him traffic, which is hurting his advertising revenues and other sponsorship opportunities. On Dec. 2, in one of his videos PewDiePie said he’s so frustrated about the matter, that when he hit 50 million subscribers he was going to shut down his account. Of course, PewDiePie hit his 50 million subscribers and decided to keep his channel (essentially trolling the internet). That said, he continues to rant about YouTube and its algorithm changes. Honestly, the details don’t really matter. More and more social media influencers, as well as brands leveraging social media, are frustrated with YouTube, Facebook, and more, and their ongoing algorithm changes. For example, BP has been moving away from Facebook to publish more on LinkedIn as more and more of its Facebook content goes unseen. Takeaway: As I travel the globe talking to enterprises about this issue, frustration is at the highest level I’ve seen. In 2017, I believe two things will happen — there will be more advertising on social media platforms and less organic publishing. The case can be made that a brand does not need to publish organic content on any social platform and instead can opt for an owned platform (website) plus paid promotion to create and grow an audience. Of course, social media sharing can happen, but the brand doesn’t need to be present on that platform for sharing to happen. According to Campaign Monitor, social media darling BuzzFeed added over 1 million email subscribers in the past 12 months. How? The answer can be found in trend No. 3. With social media channels moving toward revenue growth, brands have almost no control over communicating with fans and followers. Of all the ways to grow an audience, email has emerged as THE most critical. Other media brands are following suit. For example, The Washington Post now has over 75 e-newsletters, while The New York Times has 12 people dedicated to newsletters. While some believe email is dead, the media is telling us that email is a growth area. And last but not least, our CMI/MarketingProfs B2B study found that email was rated as the No. 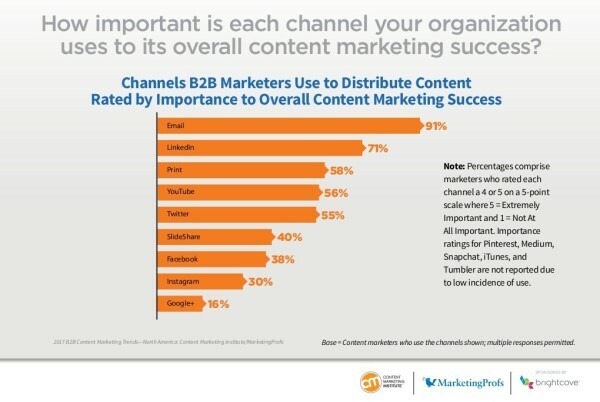 1 success metric for measuring content marketing. Airbnb and publishing partner Hearst recently announced the launch of a new print magazine appropriately called Airbnb mag. 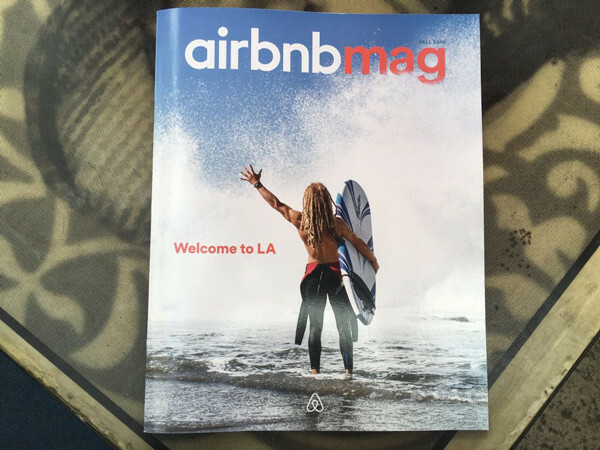 The magazine will be distributed to Airbnb homes and include content created and curated from people who provide and use the Airbnb service. Not to be outdone, School of Doodle just launched a print magazine as did VFiles. And, not that you’ve noticed, but print magazines as a tactic for content marketers have been steady for the past couple of years (according to our research). I believe we’ve hit a bottom in print’s decline as more marketers look to cut through the digital clutter with (what else?) print. Takeaway: I expect a number of big brands to launch print magazines in 2017. The targeted, niche publications will complement some online component (but be valuable in and of themselves). What trends to you expect to see in 2017? Let me know in the comments. 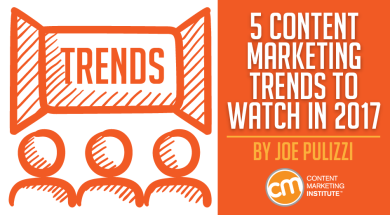 Stay on top of the trends and your content marketing program too! Subscribe to CMI’s free daily newsletter.